Tiny A will be turning 10 months soon, and sleep training has been a very weird experience with him. Ever since he was very little he’s been bothered by too much noise, light and sound. Everything is very interesting to him, so he needs to almost be devoid of external stimuli in order to shut down and be able to sleep. He slept in his own room and his own crib starting 2 months, as our getting ready for bed at night was waking him up. 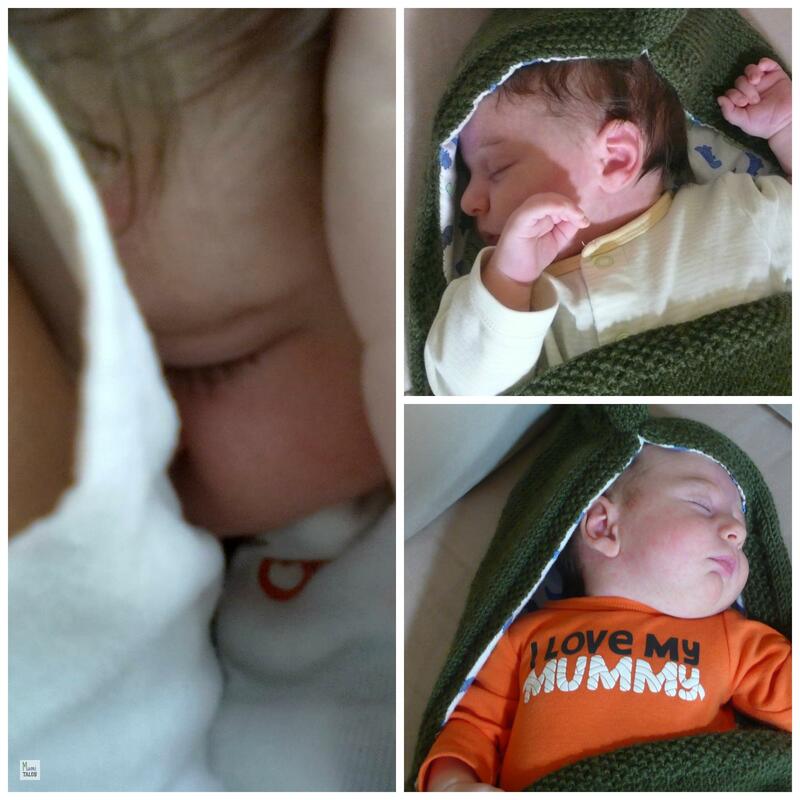 At 3 months he started sleeping through the night, and not wake up until next morning — I would sing to him, cuddle him up and then put him to bed still drowsy with the pacifier. He’d fall asleep and wake up 11 to 12 hours later. I wasn’t even nursing him to sleep, as he was a spitter-upper, so I had to hold him upright for 30 minutes after each nursing session (which made night-feedings particularly horrid and difficult for me). Life was great and everything was perfect… until he started to sit up on his own. Once Tiny A learned how to sit up, he’d spring up like a Jack-in-the-box at the slightest sleep disturbance. At some point we were certain he was sleep-crawling. Giving him the pacifier stopped doing the trick — he was definitely hungry. At 6 moths he also went through a cold, then a trip, then a growth spurt… which meant he was eating every 3 hours, day or night. The up side of the sitting up was that his spitting up virtually disappeared (it took some time, but by month 7 I could put him down right after nursing with nothing coming back out). I started nursing him to sleep, then nursing him in the middle of the night and putting him back down to sleep. It’s now been almost 4 months of this, and I now think that the biggest accomplishment is when he only wakes up once to feed at night. I have not tried to night-wean him as he is in the lighter side (5 percentile), and he definitely eats when he wakes up at night — not just for comfort, but really eating from both breasts. He’s eating solids during the day apart from nursing, and he eats like a champ (you can also look for the feeding posts in this blog, to see what he’s eating these days). About three days ago, too tired of waking up in the middle of the night, I decided to try and “sleep training” him. I’ve been including the reading of a story and music to the nightly ritual, so this time I was set on putting him down drowsy and not taking him out of the crib again. And All Hell Broke Loose. First he thought we were playing, so he started crawling all over the bed and making funny faces to me. I tried to show him that outside it was dark and it was time to go to bed, and he felt we were playing a game of peek-a-boo with the curtain. When I was not playing along with all his cuteness, he stood up and started complaining. I tried to gently lay him down and coax him to sleep, rubbing his back. He was not having it. I talked to him and told him it was time to go to bed, and that I was going to stay with him, but all he wanted was to be held. I left for a bit to see if that did the trick, but he just got wound up and in a full blown tantrum. My husband tried to comfort him, but it didn’t work either. We had gone so far with it that we decided that taking him out of the crib was going to be counter-productive… but the guy just screamed and got super mad, and the tantrum lasted for a whole hour. He finally keeled-over and passed out. Then he had a fitful night sleep. Aubrey was easy like your daughter. And luke is difficult like your son. :/ He goes to sleep totally easy (around 7:45) but by 10:30/11pm he’s awake crying. We wait a few minutes to see if he’ll calm down, but no. I don’t want to nurse him again but most times i do. Last night i actually had pumped around 10 cuz I thought he’d sleep. HA! So he “nursed” (basically more of a human pacifier) and calmed down. put him in the crib and POP! screaming hysterically and all over the crib. Left him for a bit and he started calming down. At one point he was quiet for 15 minutes. and then totally lost it. I went in around 11:30 again and couldn’t calm him down. My husband went in around midnight and he was just thrashing all around while trying to hold him. So he eventually put him back in the crib and just left. He did fall asleep. It’s hard when you can’t figure out ANYTHING to calm them down. very frustrating & exhausting. I keep thinking he’ll change, outgrow it, and then we go through a few nights of awful sleep (sunday night he was up every TWO HOURS) and I wonder how soon till I can have coffee in the am. Melissa, I’m so sorry to hear this!! It’s really weird with the sleep thing… truth be told, no other young animal sleeps on their own — and babies want to be with their moms 🙂 I’m sure he’ll outgrow it, and I’m just going with the approach of making nighttime a pleasant experience for him to look forward to. Let’s hope eventually we can conquer the sleepless nights! Erika – Your instinct is best. Young babies should not be sleeping on their own. They will let you know when they are ready. Thanks for throwing out the sleep training ‘torture’. Babies want to be with their parents 100% during the “in-arms” phase. After they begin crawling they should sleep on their own without any trouble if allowed to explore to their heart’s and curiosities content during the day. Their ‘crib’ should be a mattress on the floor so they have control.